To partner the super-cool WR8 3.0 World Rally Championship replica, we’ve also got a Flux-powered electric version that is tuned for tarmac rally fun and excitement! The WR8 Flux has all of the tough drivetrain components of the nitro version, however it’s powered by a 4000Kv Flux Vektor motor and your choice of 2S or 3S LiPo battery. It’s ready to fly over jumps and blast down the street right out of the box! The Flux VEKTOR 4000 motor delivers massive power – plenty of juice for instant acceleration and enough power to pull out of just about any sideways drift. Option pinion gears are available to fine-tune the speed and torque delivery! The brushless design assures maximum performance with nearly no maintenance required. Controlling the Savage XS Flux is easy with the HPI TF-40 2.4GHz radio system. No need to worry about changing crystals, the radio prevents frequency conflicts automatically. The TF-40 pistol grip transmitter features adjustments for steering trim, throttle trim, steering dual rate, end points, servo reversing switches, low battery indicator, and a 3rd channel for optional accessories. The 3-channel receiver is equipped with a failsafe system for maximum safety. 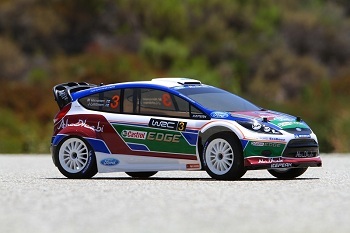 The body is based off the WRC Ford Fiesta Abu Dhabi full size rally car with matching rear wing. New suspension arms that feature droop screw holds and structural reinforcement for increased durability. New mudguards are held securely in place via two button head screws while the mud guards themselves protect the shock shafts from debris in order to promote seal longevity. Sealed adjustable grease filled front and rear gear differentials plus a silicone oil-filed center differential for high traction and drive-train protection. 2S or 3S LiPo compatible along with an adjustable battery tray for weight distribution adjustments. Adjustable sway bars come pre-installed on the WRX Flux.